The Chats section displays all the contacts from your Agenda, in alphabetical order. 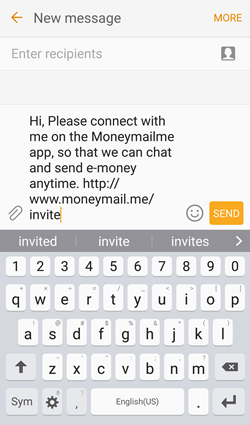 It will display first all other Moneymailme users, followed by your other contacts which you can invite to use Moneymailme application. Upon hold on a contact, a menu with two options is available: View profile and Open contact. View profile of a Moneymailme user opens a window in which the profile picture, the current status, the last seen timestamp and the phone number are visible. You can choose to call the contact directly, using your Phone application. View profile of a non-Moneymailme user displays only the phone number of the contact. Open contact will open the contact using your Agenda application. 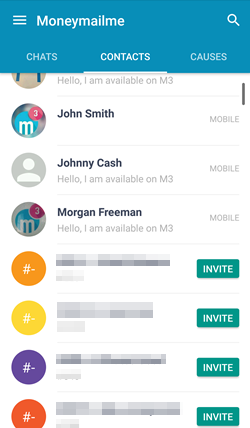 You can invite a non-Moneymailme user to start using Moneymailme application by pressing on Invite button. This will open your SMS application with a predefined text that you can send to your friend. Tip: You can refresh the Contacts list by dragging it down.